Corsair VS1GSDS667D2 DDR2 667 MHz. 1GB. Laptop Memory. Corsair VS512SDS667D2 ValueSelect PC2-5300 512MB. Corsair VS512SDS667D2 ValueSelect PC2-5300 512MB. DDR2-667 MHz. HP 512MB 446494-001 Memory. HP Compaq 417054-001 512MB PC2-5300 SODIMM Memory Hynix 418855-001 2RX16 PC2-5300-555-12 Laptop Memory. Hynix 512MB 2Rx16 HYMP564S64S64CP6-Y5 AB PC2-5300S-555-12. Hynix HYMD232M646A6-H Laptop Memory. Refurbished. Hynix HYMP532S64BP6-Y5 AA. 256MB. Refurbished. IBM Thinkpad 38L2982 128mb PC100 100MHz SODIMM SDRAM Infineon HYS64T64020HDL-3S-B 512MB PC2-5300 667MHz DDR2 Kingston 1GB DDR PC2-5300 667MHz Laptop Memory. New. Kingston KVR667D2S5/1G. Laptop Memory. New. Kingston SO100/128 PC100 128MB. Micron 20L0265 PC100 128MB 100Mhz 144-Pin SOSIMM SDRAM. Micron MT16JSF25664HZ-1G1F1 2GB Laptop Memory. Micron MT8LSDT864HG-662B3 64MB Memory. Nanya NT128D64S88A2GM-7K. 128MB DDR-266MHz Memory. 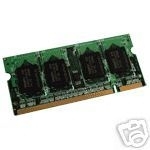 ProMOS 256MB PC4200 SODIMM Memory. New. Samsung 361523-002 Laptop Memory. 512MB. Samsung 431402-001 512MB 2RX16 PC2 5300 Memory. Samsung 464S1724BT1-L1L 128MB PC100 144-pin. 20L0265. Samsung M464S1724BT1-L1L 128MB PC100. Samsung M470L3324FT0-CB3 256MB. Refurbished. Samsung M470T6554CZ3-CE6 512MB PC2-5300 Laptop Memory. Samsung M471B773CHS-CH9 2GB Memory.